Fill your restroom with the classic elegance of the Fontaine antiqued vessel sink. An antique-style Chinese floral pattern in blue coats the off-white surface for a rich traditional appeal. Made entirely of 0.5-inch thick porcelain, this gorgeous bowl-shaped sink is coated in a non-porous finish for easy cleaning. 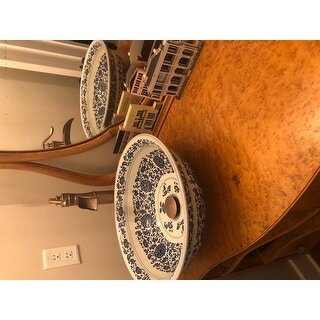 I ordered this vessel sink for my bathroom to go on an antique dresser turned vanity. The sink is heavy-duty, built with solid quality construction. The background is not white, as other reviewers have noted, but that does not detract from the antique look of this sink. My caution to future purchasers is to find a vessel filler faucet that has at least a six inch reach, preferably a little more. I originally ordered a bathroom vessel filler faucet that had a four inch reach and stood eight inches tall and had to return it for a kitchen/bar faucet that was 11 inches tall with an eight inch reach. 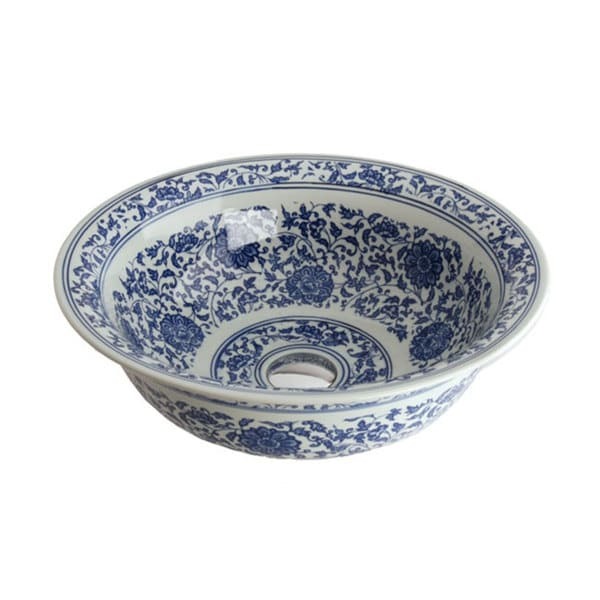 I have a large collection of blue and white porcelain in my home. 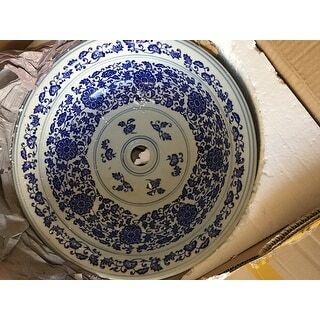 This is exactly what I have been looking for and the blue and white matches typical blue and white porcelain (which is not usually "bright" white unless it is a reproduction in my experience). I could not be happier. The sink arrived well packed and in perfect shape. I have not installed it yet but certainly appreciate one of the other reviews that commented about the reach needed for the faucet. I intend to get a kitchen-size faucet with the appropriate reach for this lovely vessel sink that will be installed on the top of an antique walnut washstand with a white carrera marble top (saving the original granite top and getting new marble to be cut out for faucet and drain -- then can reconvert the piece later if I ever want to do so). If you collect blue and white porcelain like I do, never fear -- the colors are perfect to blend right in with your collection. This sink is absolutely beautiful...you will find it in restoration magazines for 2X the price! The "imperfections" in the sink detail are are what makes it wonderful! The background glaze is NOT pure white like the picture, but rather a greyish green. The blue floral design is lighter in some places and darker in others, the design is not perfectly symmetrical...all of which lends to a more handpainted look, which was perfect paired with the antique washstand that we set the piece on! No installation problems (at least not to do with the sink!) Sink comes with a HUGE dome type pop-up style drain. 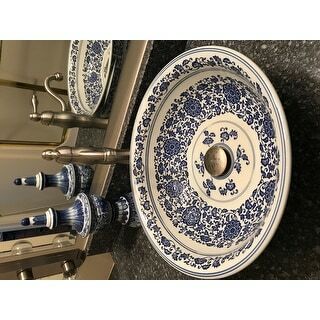 I absolutely love my blue & white vessel sink. I found it after I had already ordered blue quartz countertop but it looks amazing sitting on it. Our house is 86 years old & our bedroom is blue & white! Breathlessly beautiful! My sink arrived today and it is beautiful! It is not a factory “cookie cutter” sink. It is classic blue and white transfer ware on porcelain. The pattern is hand applied which makes each one unique. 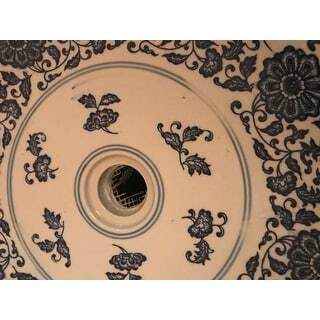 Some parts have a little blue smudge which is typical of transfer ware. You can see it on the classic Blue Willow dinnerware. The overall impression is beautiful and I am very happy with my purchase! The packaging was also very good to keep any damage from happening during shipping. I am so pleased I ordered this sink. I thought it might be a bit over the top but it is so beautiful it is the centerpiece of a room. I have placed in a bathroom that is primarily mid-wood tones and white porcelain. The fixtures are copper/antique bronze so the bowl really does shine. It might be too much in a bath with a lot of other decorator items. I bought this for my spouse who is an antiques dealer. He always said he would not have a vessel sink. When he saw this one he said he was in love. Sadly. the first sink was broken in shipping but Overstock.com immediately sent me a new one. Great produce and customer service both. Received my sink bowl although it took longer than expected due to it being directed to the wrong shipping depot by I assume ***. Outer box came extremely damaged but the bowl itself was packed very well and had no damage. It is beautiful!! I love it!!! Only negative thing I can say is the printing on the bowl is a little messed up in places but not overly noticible. Lines have some fading, pattern doenst line up perfect but overall a gorgeous vessel sink. I priced ones similar and they ran $***-*** so for the price I was extremely happy. No other items came with the bowl as in the plumbing with the stopper. We had to buy that on our own. You only get the Vessel sink. Period. I would highly recommend!!!! This is a beautiful sink, especially for the price. It's perfect for my Victorian house restoration, as it looks almost exactly like an antique wash basin minus the pitcher. My only criticism is that the transfer pattern is not perfectly applied in several spots - but that is minor given the overall impression and the very reasonable cost. I'm very pleased with this purchase, and would certainly recommend the same to anyone looking for a lovely sink which is compatible with either antique or contemporary furnishings. First, the postive feedback. I was surprised that the sink was shipped so quickly and with such a reasonable shipping cost. It was packaged very well. I was disappointed with the appearance because in the picture the sink looks very white with the blue design. It actually looks more grayish. The design is not painted on a white background as it looks but fused into the glass which is a different look than I expected. Still for the price, I guess it's acceptable and I'm hoping once it is installed on a white vanity it will look better. I'm very pleased with my new vessel sink, but I am glad that I knew ahead of time that it would be off-white rather than pure white. This was so pretty in the ad. I was surprised to find that it was so much nicer whein I received it. Exactly .what I have been looking for. More beautiful in person! Can’t wait to install it on top of our antique chest/sink vanity! Looks amazing! We converted an old piece of furniture into a vanity. This piece finished the product beautifully. Great quality addition to a piece we already loved. I love this sink i put it in an antique dresser ( as a vanity) and I like that it is unique and beautiful! And with the design on the sink it almost always look clean! I love my sink. It does not have an overflow. You don't need one. It's gorgeous exactly what I wanted. I hope this helps. They are beautiful in the picture but unfortunately the blue inside the sink is faded like it has been used. The stripe inside isn't segmented -discolored. I am so sad -I asked for a refund or discount-nothing! Very unhappy with overstock right now. At this point the plumber is coming so I don't have time to ship back (I haven't heard back from overstock after sending pictures) so I'll have to install but for the price it is very disappointing! The blue is even smeared. I love this vessel sink so much! I actually ordered two of them. Most vessel sinks are so contemporary looking and my style is much more traditional. This is a great blend of both. It's beautiful! 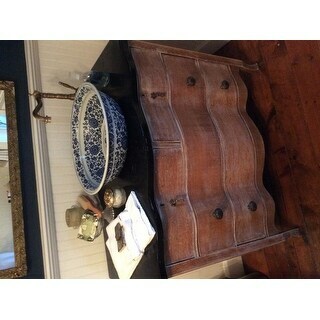 Beautiful vessel sink, was too big for our intended use, so we regrettably had to return it. Easy return and fast credit to our account. I love this sink. It is going to be perfect mounted on the antique wash stand that I will be using as a vanity in my guest bath. It looks very much like a porcelain wash basin from the turn of the century. This vessel sink is more beautiful than what you see in the picture. The quality matches the beauty - it was better than expected! Beautiful sink. the colors and detail are great. It was larger than I thought it was, so please make sure you look at the dimensions. This is an oversized vessel sink. "Is the 16 1/2 diameter measured at the top of the sink or the base? If it the top, what is the diameter of the base?" "does this sink have an overflow? The pop up drain that shows up is designed for an overflow. Does it also work with a sink without an overflow?" "I have seen in some of the reviews that there is a slight rise in the basin of the sink causing water to pool and not drain completely, has this been fixed or is ti still the case?" "You don’t show any dimensions for this vessel sink. Can you please do that. " "do you have cut out info, maybe 1 3/4'' is enough"
Hello continental, the drain hole is approximately 1.75 inches. Have a great day! It matches other patterns in my house decor. Seems a good value in reviews and liked this traditional blue and white design for a touch of detail in a vintage home bath renovation. "is there a cabinet to go with this sink bowl?" Hi bkinterne, we do not currently have a cabinet to go with this lovely vessel sink. Thanks for shopping with us! Sherri R.